The Montana Grizzlies returned the proving grounds at Dornblaser Field for the second practice of fall camp on a toasty Missoula Thursday afternoon. What was clear to those in attendance is that the offseason rust had been sweat out of the Griz on Day 1, and the Grizzlies’ execution level returned to near pre-summer levels in the helmets-only outing. The excitement of getting to play college football hasn’t worn off, with the players running through a physical practice, despite the lack of pads. “Without pads on, we’re still going hard, 100-percent. Coach Hauck preaches toughness and that’s what we’re out here to do every single day,” said junior wide receiver Jerry Louie-McGee. 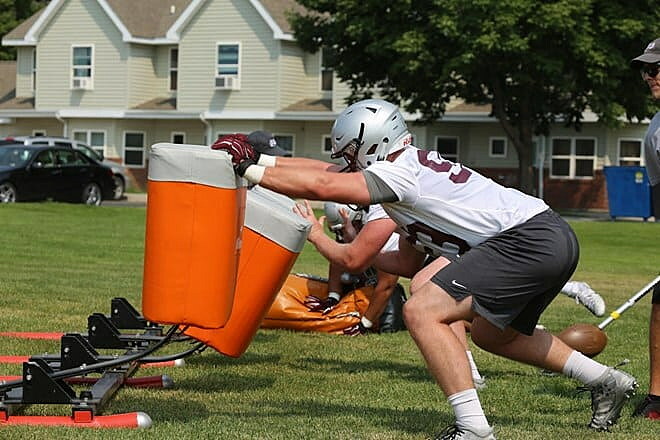 After four days, Montana’s fall camp is starting to take a “Groundhog Day” feel, with the players and staff sticking to a similar schedule day in, and day out to maximize time together and hone-in on the finer points of football. Hauck says the schedule is an essential tool that helped lead to the incremental improvements he saw at practice two. Montana took the field for the second-straight practice without pads as the coaching staff works through the install process in the early days of camp. Temperatures in Missoula once again hovered in the mid-to-upper 90’s to make it another sweaty day on the natural grass surface. But without pads, Hauck says the heat hasn’t affected the team much, with the coaching and training staffs preaching proper hydration and nutrition to help prevent fatigue. Several young players on both sides of the ball helped make a name for themselves with big plays on Thursday. Freshman defensive end Braydon Deming of Billings got in on a sack, and fellow freshman RJ Nelson put some heavy pressure on the quarterbacks during the second team run of the afternoon. Sophomore linebacker Jace Lewis hung on to an improbable interception later in practice, watching the ball in as it bounced off his hands several times before finally gaining control. In the same session, Samuel Akem hauled in a deep ball on a post route from quarterback Cam Humphrey, and Dalton Sneed found Louie-McGee across the middle for the second leaping catch in traffic in as many days. Sophomore Jed Nagler of Whitefish got in on a sack, a nice reward for the former receiver who transitioned to linebacker in the spring. Justin Calhoun has also found himself in a new position this fall, making the switch from receiver to cornerback. It didn’t take long for the athletic junior to make an impact, picking up a pass breakup while moving backward across the middle to make a heads-up play. Sophomore Samori Toure continued to impress as well, stretching out to haul in a deep pass from Humphrey down the right sideline in the final team run period. Montana returns to Dornblaser on Friday at 2:30 for practice No. 3, which will once again be a helmets-only practice. The Griz will put on shells for Saturday’s practice, and get their first run-through in full pads on Sunday before taking a day off to enjoy the Pearl Jam concert in Missoula on Monday.